Everything came to a head on the ride home. It was a 16- or 17-hour ride, and as usual I did all the driving. Maybe it was bad attitude, maybe I was overzealous, or maybe it was the overall immaturity. But we got to the GW Terminal [George Washington Bridge Bus Station], and they told me to get out of the car and take the bus: “We’re not letting you drive back, we’re teaching you a lesson.” After driving 16 hours, I was exhausted. OK, the Rush thing was a bomb, and it was a learning curve for everybody, but what are you talking about, teaching me a lesson? They replied, “You know what you did.” I looked back and said, “What’s going on?” No one in the band would make eye contact. Scott and Richie hid in the back, Ross and Andy looked away and shrugged. I got my suitcase and sneakers, got out of the car, told them “F*ck you,” and I quit. It was all heat of the moment, but they used that as gospel. I picked the drums up a few days later. There was a whole lot of immaturity in the band at the time. There’s an expression, “boys in men’s pants,” and that’s really what you were. You were young kids, 20- and 21-year-olds who had it handed to them, and it was way too much too soon. Things might have been different if you had had a father figure for a manager instead of Murray and Sandy, who were only a few years older. Someone with enough of an age separation to put the firm hand on your collective shoulders and say, “Look, this is not the way you should act.” Like a coach! But you didn’t have that. The label gave Murray and Sandy too much leeway by trusting them to watch you guys from start to finish, and the ball got dropped. That was when Murray and Sandy should have stepped in. There were talks going on between Murray and Sandy with the band for a couple of weeks while everything was on ice. 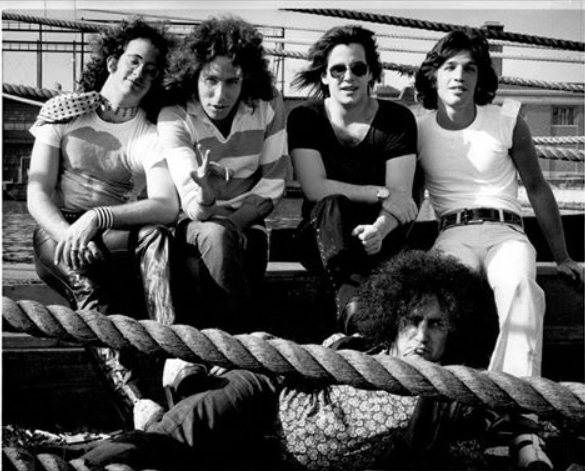 The band wouldn’t find a way to try and make peace, and Murray and Sandy finally told me, “Stu, they’re freezing you out of the band.” They didn’t realize they were freezing themselves as a band. They had a five-year contract they couldn’t live up to without a drummer, so Epic took the option to put the band in the fridge and dropped them. Not only did they shoot me, but they shot themselves in the foot. Talk about cutting off your nose to spite your face. When a band gets that far at 21 years old, if they’re not managed properly, they’re going to die. Murray and Sandy, having youngsters like us in a band, were too liberal with what was going on. Structure was not there with them as managers and producers. They should have intervened, even though they were still young themselves, but their attitude was “let artists be artists.” Well, that’s true, but just as they imposed their will to get Richie in the band, they should have done the same thing and told them, “This isn’t the way to go with Stu.” I was the guy you would want to go to war with, but between my ambition and impatience, and our overall immaturity, we just weren’t ready. It was too much too soon. 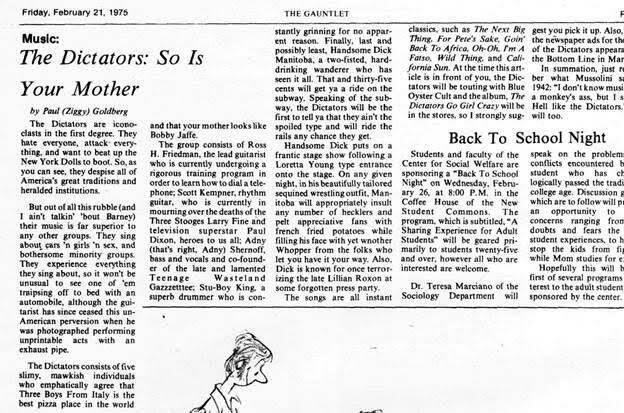 Review from the Gauntlet, 1975. We’re not happy that the last column is cut off either. It hurt the band. 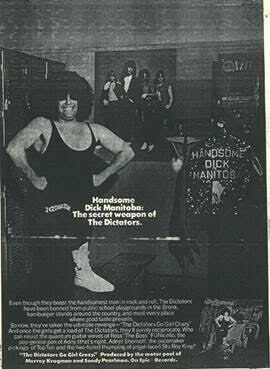 At the end of it all, the Dictators could have been a lot bigger. Every single person in the band had a heart, and they all badly wanted to be musicians. It’s been proven by time, by how they all persevered. We could have been the punk rock version of the Who. The original Dictators were together too short a period of time for angst and egos to ruin things. The band couldn’t do anything for close to two years until the second LP, and the Ramones and Blondie and Television and everyone else came along in that void. We opened the floodgates, everyone else followed. How people look at the second LP [‘Manifest Destiny,’ released on Asylum in 1977], I don’t know. I do know that the first album was considered the best of the batch. I think the band got worse on the second album. Not because I wasn’t there, but because the music fell short. I’m not surprised. The music changed for the worse. It was like taking Keith Moon out of the Who, and trying to find a duplicate. You might find someone who could copy, but you’ll never get the originality. You four simply were not all at the same point evolution- and skill-wise. Not even close. That had a lot to do with your not getting along. It’s amazing that ‘Go Girl Crazy’ came out as polished as it did. It goes to show how much the band’s exuberance, and the strength of the songs, combined to make up for the overall inexperience. The LP was a great original piece of work. It was all about having a good time, and it showed in the results. It’s my claim to fame! Not bad for a hick kid from the boonies. 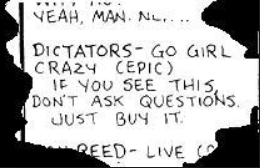 I used to think that Epic signed the band to use us as a tax shelter. It sounds crazy, but it goes a long way towards explaining why the label was so quick to dump the band. Who knows how the $30,000 that was spent on the LP was written up in the books? There has been a recurring theme from the guys who came into the band that were not part of the four-man core, that if you were the one who wasn’t part of their gang, those guys would make you feel like an outsider. Did you have to put up with that as well? It’s an interesting point. We were very close, because we grew up in the same circles, and then had the New Paltz factor. There was a lot of childish, running with the pack behavior, that bound all of us, the original band, together. I used to pick these guys up! No one had a car except me, so for two years I’d drive down from Rockland, go to the Bronx and Queens to pick them up to go to the practice studio, and then we’d go hang out. Looking back at it, I was paying my dues that way, by being the driver. We’d hang out together, I’d sleep over their houses every once in a while. Andy and I went to Puerto Rico together on vacation once! Our parents paid for it. You have to understand that the Dictators were a clique, and those [later] guys came in after the fact as hired hands. I don’t want to put down their artistic value, but the later guys were Johnny-come-latelies, and they weren’t going to be allowed into the Inner Club. I can understand the distance, but I can’t explain it. There was no such distance between the Dictators and I. It’s what made being fired hurt so much then, and still hurt to this day. I loved those guys like brothers. I was one of them.